If the temperature is expected to be scorching during your summer race, it is important for you to be extra vigilant in your hydration preparation, sipping consistently before, during and after your race, to ensure good health and performance as you cross the finish line. Hydration may not directly provide your body with the energy you need to get through your race in terms of calories, carbohydrates and protein, but it is essential for every cell in your body to function smoothly. After all, your body is composed of about 65 percent water. Under normal conditions, when your core body temperature rises due to elevated outside temperatures or exercise, your body recognizes that you feel hot and you make changes to cool off, such as moving into the shade. Internally, your body recognizes this increase in temperature and starts sweating.2 The same process occurs when you are exercising due to a rise in core body temperature. Your sweat glands produce sweat, which is carried to the surface of your skin and evaporates to dissipate heat. Another method of thermoregulation is via hydration. Your physiological thirst response, which tells your brain that you need to drink water, turns on when your core body temperature rises due to exercise and/or elevated external temperatures. When you race in the height of summer heat and humidity, your body needs to work twice as hard to dissipate the physical heat you are creating when running, as well as combat external temperatures. Like most exercise, running places high demands on your muscles. Some estimate that your muscles produce up to 100 times more heat while running than they do at rest. To dissipate this heat, you sweat. Sweat droplets rise to the surface of your skin and usually evaporate to reduce your internal body temperature. If the humidity is also elevated, your sweat response won’t cool you down enough, which may increase your risk for hyperthermia or heat stroke. Although sweating reduces your internal body temperature, it can also lead to hypohydration during a long race due to inadequate fluid intake to supplement your excessive sweat rates. This can lead to dehydration and electrolyte imbalances. These complexities may make it seem as if running a marathon in the height of summer heat and humidity is an awful idea, but now that you understand your body’s complex physiological response to heat and humidity, you can prepare properly to stay safe during your race, but also to improve your exercise performance. With acclimation, adequate hydration, and proper nutrition before race day, you can improve your race time, even on the hottest and most humid days of summer. The first step in successfully racing on a very hot and humid summer day is acclimation. If you’re flying in just for race day, you are doing your body and your race time results a disservice. Acclimation or acclimatization is the process by which your body is better able to tolerate heat stress.6 Your body adjusts to an increase in external temperature by increasing blood volume, which is mostly water, increasing your sweat rate, reducing your heart rate, inducing hormonal responses to induce homeostasis and thermoregulation, and more. Many athletes do not hydrate appropriately during extended activity, even though it is of the utmost importance in hot and humid conditions. Studies show that exercising in hot conditions with inadequate hydration is associated with elevated core body temperatures, possibly raising the risk of heat stroke, as well as cardiovascular complications due to reduced blood volume, decreases in blood pressure and therefore reduce blood flow to heavily used muscles.3 This will not only impact performance, but it is dangerous for other organs as well, such as your kidneys, liver and brain.7 If your body starts shutting down it will, no doubt, be difficult for you to finish the race, but even before reaching that point, your muscles will not receive the nourishment they require to continue, so the perceived difficulty of running increases. Adequate hydration, and even pre-hydration, helps your body cool down, aiding the thermoregulatory processes described above. 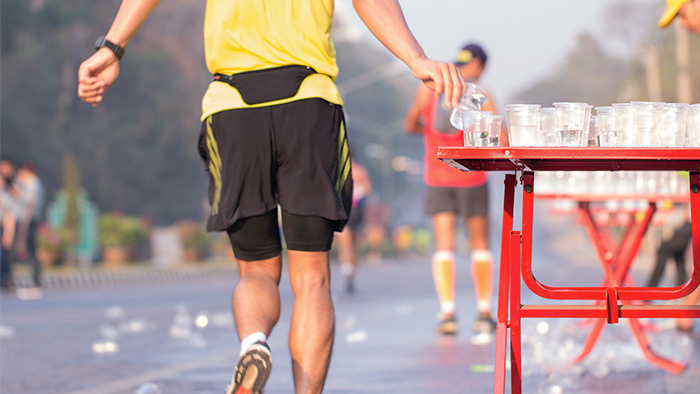 Drinking water helps reduce your body’s core internal temperature, preventing the risks associated with elevated heat and humidity on race day. Pre-hydration in the few days leading up to your race, and especially in the 24 hours prior to racing is the first step towards meeting your hydration goals. Not only does this help the acclimation process, but it ensures that you do not enter the race hypohydrated, which can strain your heart and muscles. Dehydration depletes your muscle glycogen stores faster, which leads to increased difficulty running. Drinking cool fluids about an hour before your start time is best to ensure that you set yourself up for a successful race. If you’re trying to beat your personal record, staying hydrated during your race is also essential, especially in a hot and humid climate. Losing just one percent of your body weight while racing reduces your performance by two percent.5 This is especially true in endurance events, such as a marathon. Consistently sipping fluids, including electrolyte-laced fluids, according to your thirst cues is of the utmost importance. The bottom line is that by paying attention to proper hydration and giving your body time to acclimate to conditions of heat and humidity, you can have a successful and safe summer marathon. Chelsey Amer, MS, is a registered dietitian and provides personalized nutrition counseling to both individuals and food companies. She has been a hydration consultant with Ozmo since February 2017.